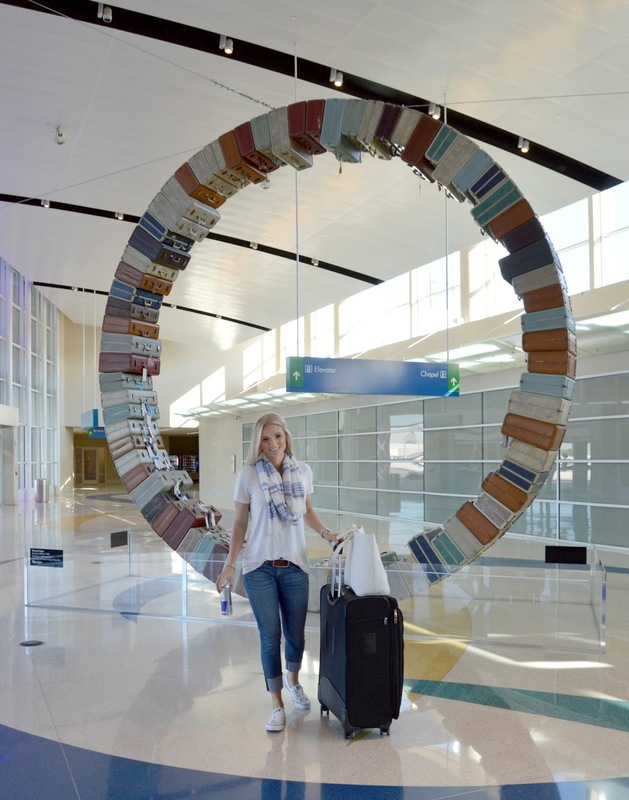 With Summer beginning, the excitement of vacation and traveling starts to rise......so does the fear of traveling with littles for the first time!! A few weeks ago Tyson and I traveled alone to Texas to visit the family and as excited as I was for his first trip to Texas, I was terrified to travel alone with him. 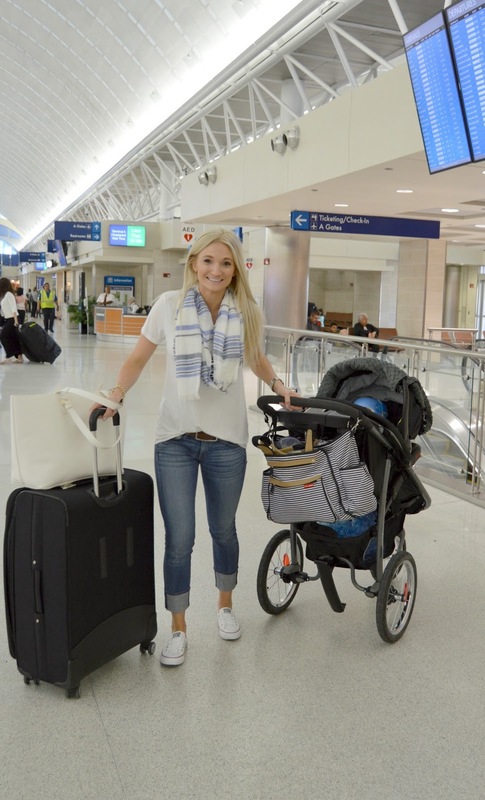 The idea of being packed like sardines in the airplane with a baby made me soooo tense. "What am I going to do if he cries?" "How am I going to be able to keep him in my lap the whole time?" "Crap this is going to be a long flight". I definitely overpacked my diaper bag for him. Better over prepared than under right? I didn't end up using half of it and really do wish that I would have packed lighter because it was a pain trying to store under the seat of the plane. After trial by fire, I feel like I've learned some good pointers that I'd like to pass along. I received this tip from my sister-in-law, and it was the best thing ever! Most of us have heard to have baby drink a bottle when the plane ascends and descends to help with the pressure changes, and having them ready to settle down just is really helpful. Going to Texas Ty fell asleep 15 min into the flight and on the way back was only able to make it 10 min which was ideal for me and everyone around us. I was actually able to flip through my Oxygen magazine!!! So this tip is a must! This is totally just my preference for a few reasons.....#1 It was nice for me to kind of lean on the wall when baby fell asleep to help support his weight, #2 Nobody is trying to get past you if they need to use the restroom, #3 when baby is awake instead of him climbing on the passengers next to you, he can look out the window and play with his toys. I read this tip on a blog and it totally made sense to me. When you have something new, your baby is so fascinated with it and likes to try and figure it out. We did this and when Ty woke up from his nap, he was entertained for a good while. Once he ended up losing interest, I had snacks and a window to keep him distracted. 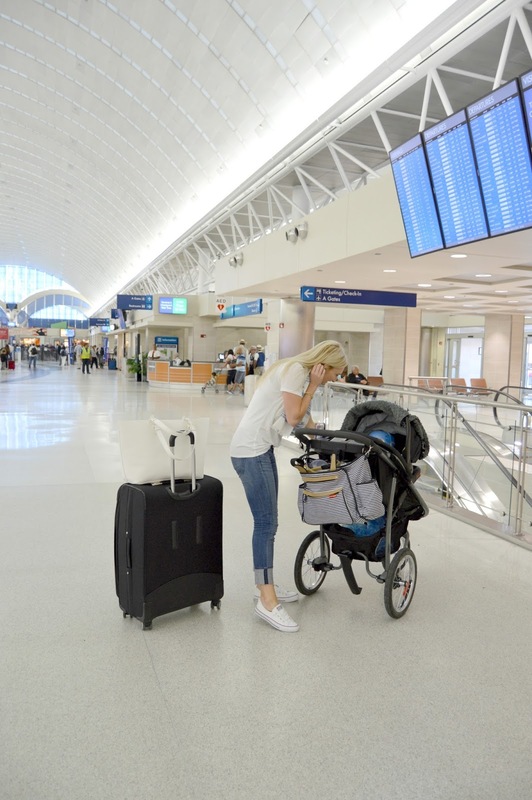 Going through security is frustrating enough when you don't have extra baby stuff to worry about, so make it easy on yourself with what you wear. Shoes that easily slip on and off are a must. I'm in love with the new converse slip ons here. They made the airport a breeze! I feel like a loose scarf, oversized T, and cropped denims is the best traveling "momiform". Light layers are great because it gets cold in the plane...and.....because your scarf can act as an impromptu blanket or bib for babe. Mine became a catch for applesauce about 2 min after we got on the plane. Better the scarf than my shirt though! This was the face of......I can do this but I'm TERRIFIED!